Sydney Muchnik ’16 was awarded a National Science Foundation (NSF) Graduate Research Fellowship. She is currently pursuing a Ph.D. at Yale University. The highly selective NSF Graduate Research Fellowship Program accepts 2,000 applicants from a nationwide pool of undergraduates in STEM fields. Fellows – such as Muchnik – receive a three-year annual stipend of $34,000, as well as an additional $12,000 to cover education costs to conduct research at any U.S. graduate institution of their choice. Fellows also benefit from the international reputation of the program, which includes numerous Nobel Prize winners, Google co-founder Sergey Brin and former U.S. Secretary of Energy Steven Chu as former Fellows. As an Illinois Wesleyan undergraduate student, Muchnik was active in the campus community where she served as President of the Math Honors Society and Vice President of Colleges Against Cancer. She also worked as a Resident Assistant and a Residential Community Advisor. In addition, Muchnik gained experience as an intern for Advocate BroMenn Volunteer Services, where she completed an extensive research project on the history of the Brokaw School of Nursing at IWU. Through her fellowship, Muchnik will continue her passion for laboratory research in the Genetics Department at Yale. Her current thesis project explores how changes in regulatory regions of DNA can shed light on how genetics have driven the evolution of distinctly human aspects of brain function and development. To do so, she will study gene transcription and modification at different stages of a human brain’s development and compare her findings to the gene sequences found in non-human primates. Muchnik has already conducted research in the Biomedical Engineering department at Yale, where she worked alongside a professor to develop a technique for single-cell cytokine secretion in real time, a process used to activate latent HIV cells for study in the lab. 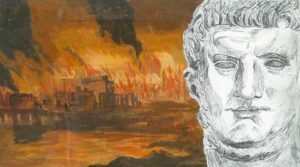 Ticket sales are live for the play written by Aaron Harris Woodstein ’15 and Composed by Sam Mullooly ’16: “The Fires of Nero: Rise of a Dictator” at Stage 773 in Chicago. The play was inspired by a paper Aaron wrote in Dani Synder-Young’s Theatre History class where he argued that one of the prominent characters Seneca wrote a play protesting the despot at the time, Nero. Now Aaron is doing the same as author and lyricist. Amongst the two other IWU Alums is Luke McLoughlin ’15 as Music Director. Happy Holidays Class of 2016! Ryan Donlin ’17, Robby Kuntz ’18, and Braden Poole ’16 are members of the band The Red Scarves. This Chicago-based pop rock band formed at IWU, and credit their jazz and classical music studies as key to creating their songs. They recently performed here in Bloomington on Sept. 30. You can read more about it here. 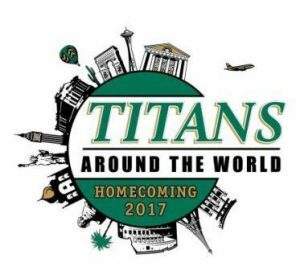 There is less than one month until Homecoming 2017! While counting down the days until we are all back on campus, let’s reminisce about the time we spent at IWU. My fondest memory from IWU is sitting on the quad during the warm fall days. 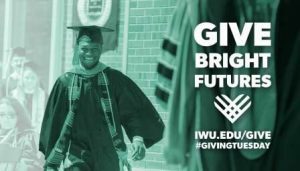 Would anyone like to share their favorite IWU memories? Comment below. If you are still deciding on which events you want to attend during Homecoming, the International RSO Fair is highly recommended. It will be on Saturday (10/14) at the Hansen Student Center, Center Court from 11 am – 1 pm. Come learn more about our multicultural registered student organizations and enjoy activities and musical performances. A light lunch will be provided, so please register either online or by phone by 10/8! 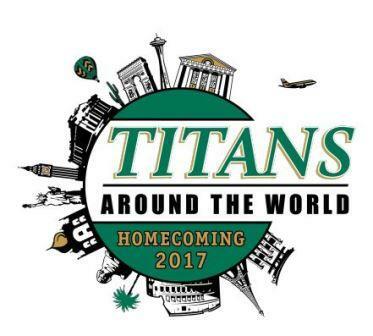 You can visit the Homecoming Facebook page or the International RSO Fair Facebook event for more information.